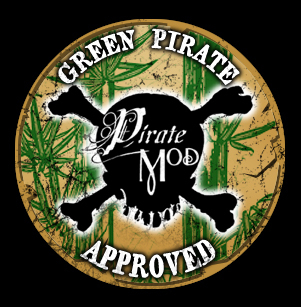 PirateMod is excited to announce that most of our great original designs are now available in Eco-Friendly Bamboo-Cotton Mens and Ladies T-Shirts! When choosing a design, just use the pulldown menu to select Bamboo Tee as your choice – and it’s a great choice! 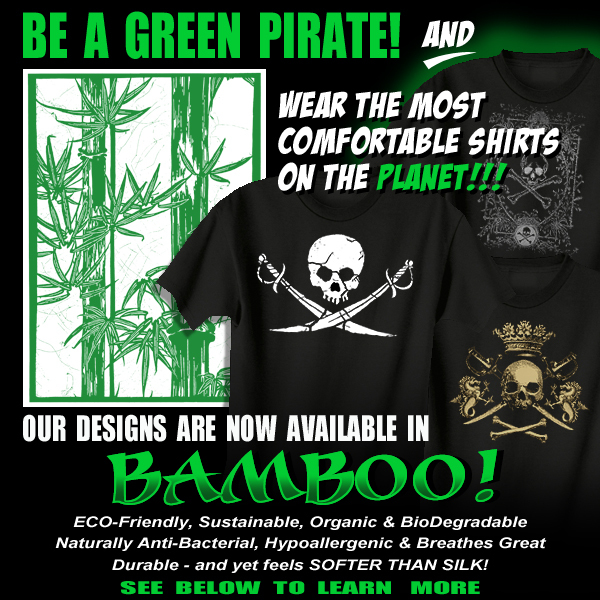 Bamboo Tees cost a few dollars more, but whether you love it for the fashion and quality, or because of its earth-friendly nature…it’s worth every cent. BAMBOO CLOTHING ROCKS IN EVERY POSSIBLE WAY!!! It’s the newest thing on the market, and we’re confident it’s going to lead the way…not only in fashion and comfort, but also in sustainable eco-friendly garments! Bamboo clothing is simply amazing. It drapes like silk, it feels as soft and good as silk or cashmere, but it is more practical because it is durable and much less expensive and versatile. Imagine that, clothing that looks good, feels good and is great for the environment! Bamboo apparel is comfortable, more breathable than cotton, fast drying, moisture-wicking, and thermal regulating. It will keep you cooler in the summer, and you can layer it to be warmer in the winter. Bamboo fiber contains a natural agent that prevents the growth of bacteria, thus prevents odor. Bamboo fiber is softer than the softest cotton, has a natural sheen to the surface and feels similar to silk or cashmere. But, it has a very high soil release value and is so durable; you can throw it in the washer and drier. Due to bamboo fiber’s cross section which is composed of a matrix with various microscopic gaps, bamboo fiber is more breathable, comfortable and thermal regulating than cotton, wool or any other synthetic fiber thereby keeping you cooler, drier and more comfortable all day. This unique micro-structure allows bamboo apparel to absorb and evaporate perspiration faster than any other fabric. It’s nice not to have your clothes sticking to your skin in the hot summer or during exercise! No dry cleaning necessary. Launder in cool water on Gentle Cycle and tumble dry low. Stain removers may be used for stubborn stains. The use of bleach or liquid fabric softener is not recommended – but fabric softener is unnecessary as bamboo fabric is naturally incredibly soft. Bamboo is one of the world’s most prolific and fastest growing plants. It is inherently organic and is grown without pesticides or chemicals, and is 100% biodegradable. With a growth rate of up to a meter or more per day, bamboo holds the world record as the fastest growing plant. Bamboo is actually not a wood but a grass, continuously sending up new shoots after harvesting without a need for replanting. Bamboo can be utilized in just 4-5 years unlike traditional hardwoods that not only take 25-70 years to mature, but also require replanting..
Bamboo absorbs nearly 5 times the amount of greenhouse gasses, and produces 35% more oxygen, than an equivalent stand of trees, making it an efficient fresh-air replenisher. Bamboo also stabilizes the earth with its erosion preventing roots, and improves the health of the soil by sequestering excess nitrogen. Cotton crops require wide spacing that allow bare soils to bake and oxidize, releasing carbon into the atmosphere and decreasing soil fertility. Further, bamboo retains water in the watershed, reduces runoff, sustains riverbanks, and helps mitigate water pollution due to its high nitrogen consumption. Plantation- raised bamboo (used in clothing manufacture) does not interfere with the habitat of Panda bears!